The weather hasn’t been great recently, but this morning brought vivid blues skies and bright sunshine. 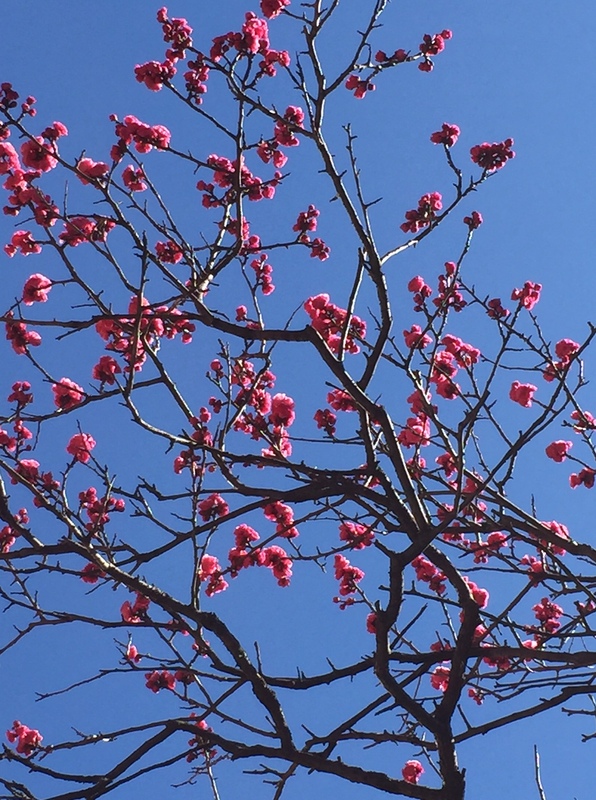 The plum tree outside my window is blooming, it was a wonderful way to start the day. It’s almost the end of the school year, so classes are over but there’s still a lot of paperwork to do and the day stretched ahead, a normal end-of-term day. Except today is not just another day, it’s March 11th, the 4th anniversary of the M9 earthquake and massive tsunami that devastated Tohoku, killed thousands, left thousands more missing and hundreds of thousands displaced and homeless. Today I have been thinking a lot about that day four years ago, about all the stresses that followed, but all the small comforts too. The earthquake struck at 2:46pm. I was at home, with my ladies’ reading group. It started as a moderate quake and just kept getting bigger. The ladies put cushions on their heads and I stood watching everything swaying and rattling. It went on and on, and the ground seemed to find a rhythm, so that the floor felt like it was rocking like a boat. I know this sounds scary, but I remember thinking, good, the building is swaying, it’s not going to fall down on top of us. I had a vase of freesias, my favourite flower, and I remember watching the flowers sway and wishing they would stop, that it would all stop. It finally did, and the ladies turned the TV on and I went into the kitchen to make cups of tea. Minutes later the first tsunami struck, and we all watched it on live TV. That still seems mind-boggling to me, that we all just watched helplessly as this wall of grey water just kept coming. It was easy to think it was just a river, until you saw the houses and the cars and realised the scale of it. The reporters on TV sat in the studio wearing hard hats, and as each aftershock struck they hung onto their desks and urged people at home to take cover, to stay safe. We tried to make phone calls, but the networks were overloaded for a while. We watched TV, drank tea and waited. About an hour later the ladies decided that they would try to go home. They left, promising to come back if they could not find a way home. I called my parents and e-mailed my brother to tell them I was OK, then started to write a general e-mail to a lot of people to tell them the same. I spent the evening watching TV and trying to take in the enormity of what had happened. I found a tiny comfort in believing that this had been the Big One, the earthquake Tokyo was long overdue. The next day I heard from a physics teacher at school that it wasn’t, my tiny comfort was gone. At about 11pm I received a phone call from three of the ladies. They had been unable to go home, because the trains weren’t running of course. They had gone to a large hospital just down the road and stayed there, making sorties to convenience stores to buy snacks and to the station to see if trains had started running. They said that there were thirty or forty people who had taken shelter in the waiting room of the hospital. However, at around eleven they were told by the hospital administration that they all had to leave, that they couldn’t stay there. This has always astounded me, that on a night when millions of people were stranded, a huge hospital told a relatively small group of people to leave, when there was nowhere really for them to go. So finally they called me, and seven hours after they had left, promising to come straight back if they found themselves stranded, they struggled back up the hill to my apartment. Instead of sitting on the sofas as they always did they all sank to the floor and sat there wide-eyed and exhausted. I made more tea, this time refusing to use the polite teacups and saucers I usually use to serve them, instead giving them big steaming mugs of tea while telling them they should have come back hours ago. I was glad of the company that night, it wasn’t really a time to be on your own. There were a lot of texts, e-mails, phone calls; we were all re-connecting and making sure everyone was all right. The next morning they were up early and left for home, wanting to get back as soon as possible. I went into school to see how everyone there was doing; over a hundred teachers and students had been stranded but the atmosphere was calm. With train lines starting up again the logistical challenge was to make sure everyone had a way home. The next few weeks were strange, a very subdued kind of everyday life. We watched as Fukushima Daiichi went to hell, though at the time we didn’t know just how hellish it was. TEPCO only revealed the meltdowns much later. We managed with the shortages, not because there was no food available, but because fuel was being diverted to Tohoku to help the people there. There wasn’t enough in Tokyo to keep shelves stocked. In all the days that followed, I don’t remember seeing anyone get angry or frustrated. There were lines to buy petrol, lines to get into the supermarket, but no one lost their temper. There was just a feeling of quietly getting on with what you could. I remember sitting on a bus in Shibuya one day and feeling the tension in the air, but looking around and seeing a bus full of calm-looking people. I felt we were all staying calm for each other. Nevertheless, I also remember a tremendous feeling of relief every time I got off the train at my local station; another errand run, another appointment kept without getting stranded. 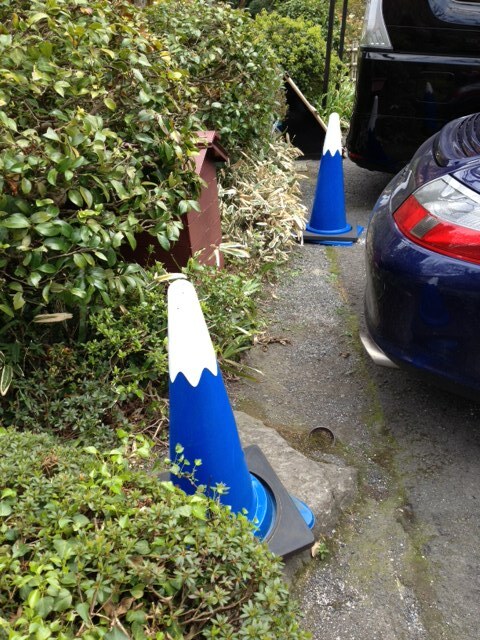 Four years later, our lives in Tokyo are back to normal. In Tohoku, however, the situation has not improved much for the survivors of the tsunami. Yesterday the National Police Agency released the latest figures: 15,891 deaths, and 2,584 people still missing. 228,863 people are still living in temporary housing or have chosen to move elsewhere permanently. A lot of the people who were displaced and still living in temporary housing are elderly; the people of working age and with families chose to leave and rebuild their lives in a new place. There is little news of TEPCO and Fukushima Daiichi, but every so often there is a news item which makes clear that the reactors are still far from safe. For the last three years I was able to go to the Anglican cathedral in Tokyo for the memorial service; today I had to be at school. Instead I went to the church next door to pray at the time the earthquake struck. 228,863 people who can’t go home. This entry was posted in Great East Japan Earthquake and tagged Fukushima Daiichi, Great East Japan Earthquake, March 11th 2011, National Police Agency, Shinagawa, Tepco, Tohoku, tsunami on March 11, 2015 by tokyopurplegirl. I love to have friends visit, and showing people around is one of my favourite things. Even after over twenty years in Japan I still enjoy being a tourist and having a visitor is the perfect excuse. In April I had a houseguest who used to live in Japan and still comes back to visit. We decided to spend a day in Hakone. 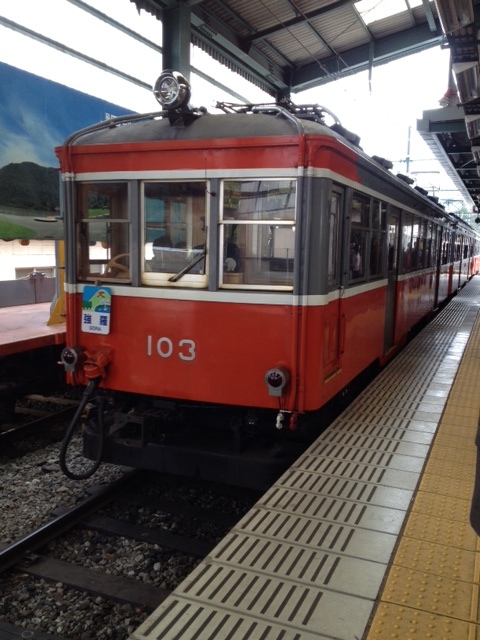 The usually circuit of Hakone, I suppose, is the Romancecar down from Shinjuku to Hakone, then a trip up through Gora to Owakudani, down to and across Lake Ashi and then the bus back to Hakone. The main problem with that is, it’s what everyone else does, and so the childish fun to be had on a succession of forms of transport is interspersed with tedious queues. 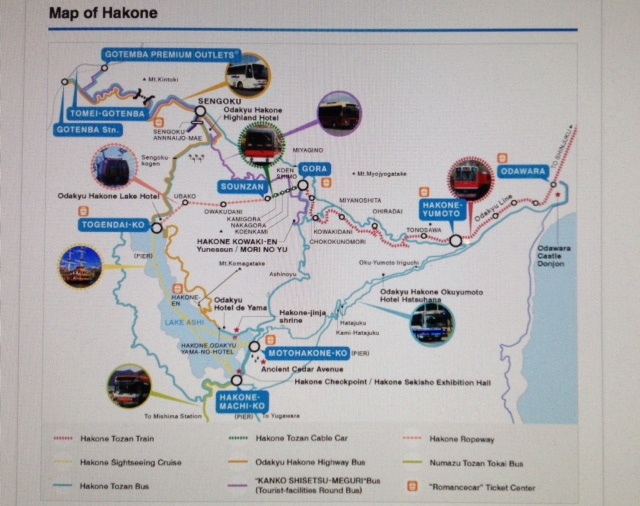 What if you visited Hakone . . . backwards? While the Romancecar is the obvious route down from Tokyo, if you’re not starting from the Shinjuku area then it’s not the cheapest or the fastest. Plan B: start from Shinagawa. The Shonan Shinjuku line stops at Shinagawa, takes about 80 minutes, and costs ¥1320. 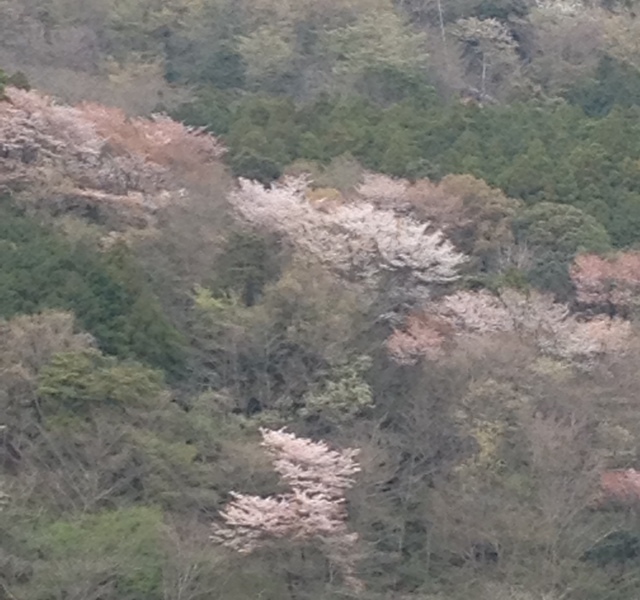 Don’t even think of going all the way down to Hakone-Yumoto. 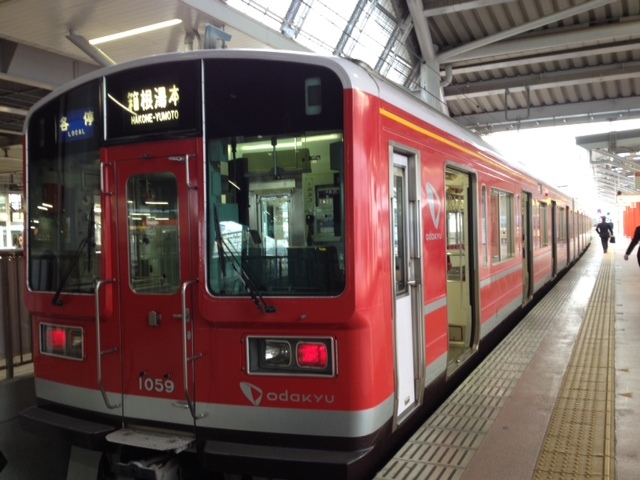 Take the train to Odawara, then buy a Hakone Freepass (¥4,000) and start from there. Once you have your Freepass you don’t have to pay for anything else. Various Landscapes Along The Way! Take the bus from stop #3 outside the station. 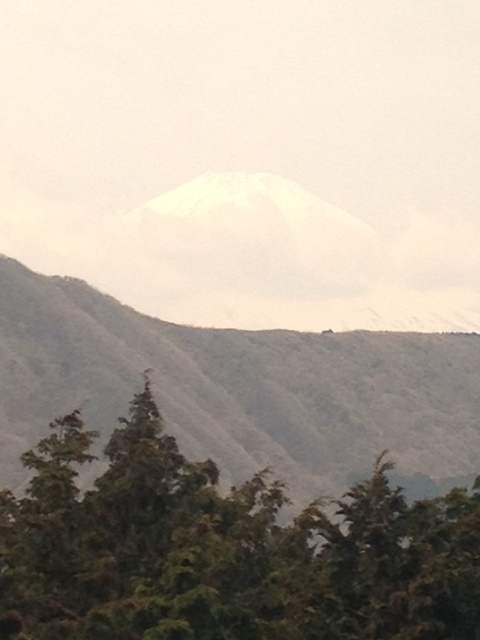 It takes about an hour to Hakonemachi. 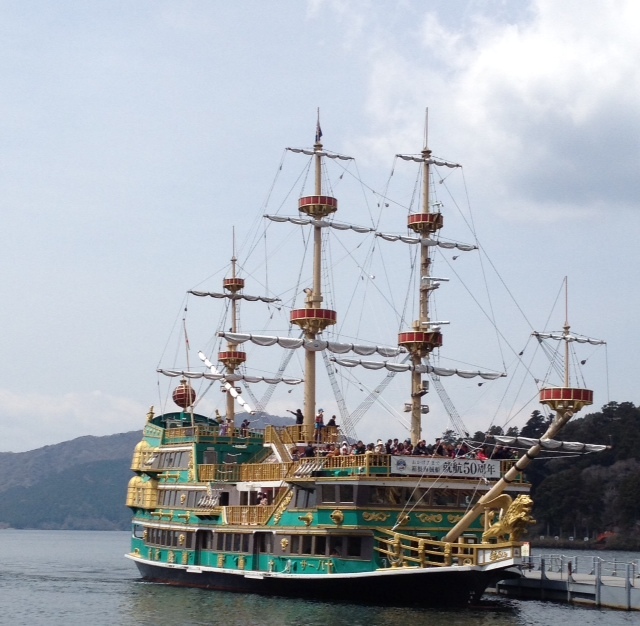 When the bus stops at Hakone-Yumoto there will be crowds of tourists waiting to get on. From your seat on the bus you’ll see their faces fall as they realise they’ll have to wait for the next bus, or the next one, while you are already on your speedy way. The bus ride is quite scenic; it winds up the mountainside and past the Fujiya Hotel; you’ll be back here in a couple of hours for afternoon tea. Well, what were you expecting? Isn’t this the best way to start your adventure in earnest? A pirate ship seems perfectly reasonable to me. Breathtaking View From The Ship! The trip across the lake can be a little chilly, and doesn’t take long at all, but you can stand on the deck, look at the views and if you’re lucky get your first good views of Mount Fuji. Of course, that depends on the season, and in the summer months it is often hazy and you won’t know there’s a huge mountain right there in front of you. From late autumn through to spring you should be luckier. 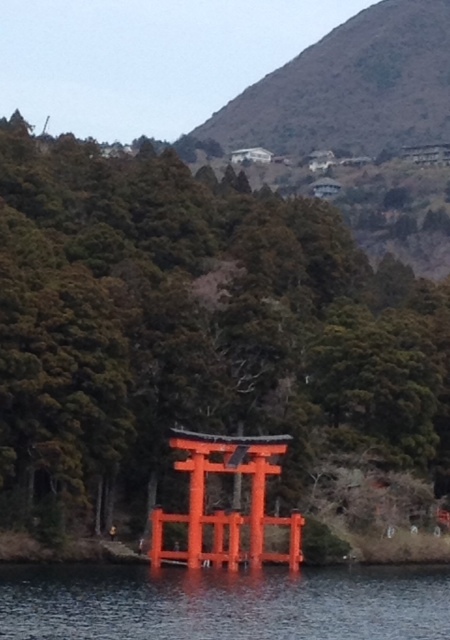 You will also see Hakone Jinja just after you set off. At the other end of the lake is Togendai, where you disembark and walk up into the terminus building for what Hakone calls a ropeway, but I would call a cable car. The cable car continues to Owakudani (where you can get out and wander around among sulphurous fumes if the fancy takes you). 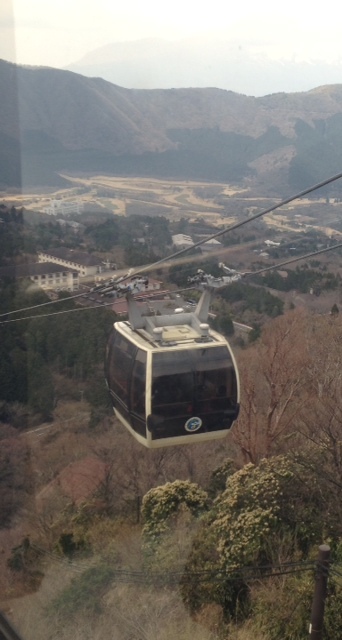 Otherwise you get on the next leg of the ropeway to Sounzan. Even if you don’t want to wander about you have to get out of the cable car, and walk through the building to the next leg of the journey. You may see long lines of people waiting to travel in the opposite direction. From here the ropeway goes down the other side of the mountain to Sounzan and on the way you’ll catch your last views of Mount Fuji. 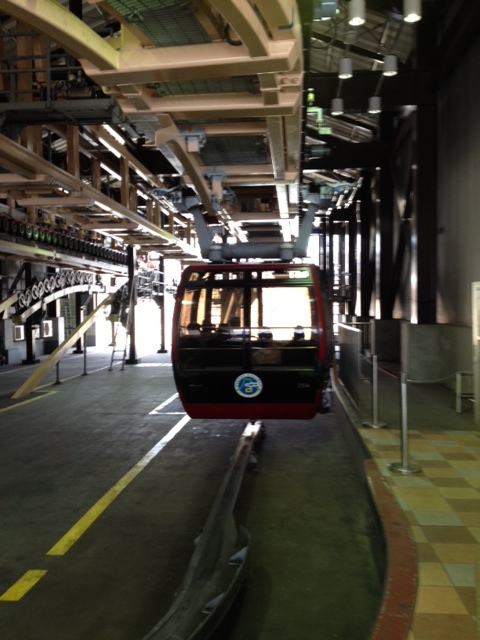 Tired of the ropeway? Wanting a change of transport? Next up is the funicular railway, or, apparently, the cable car. When it arrives at Sounzan hordes of people disembark from the crowded train; on the way down there is a lot more space, and views of cherry blossoms, hydrangeas, other blossoms or autumn colours, depending on when you go. This is a short trip, and when you get off it is only a few metres from the platform through to the platform for the train which goes all the way down to Hakone-Yumoto. Down The Mountain We Go! While this is the most conventional of all the modes of transport so far, it is still only a small, clanking train, a lot like the Enoden line in Kamakura. 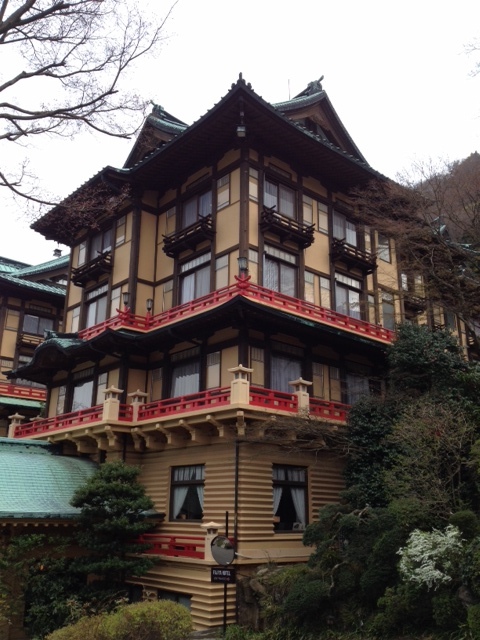 From here you can go straight down to the end of the line, but I recommend a stop in Miyanoshita, and a visit to the Fujiya Hotel, built in 1891 and one-time holiday destination of John Lennon and Yoko Ono. 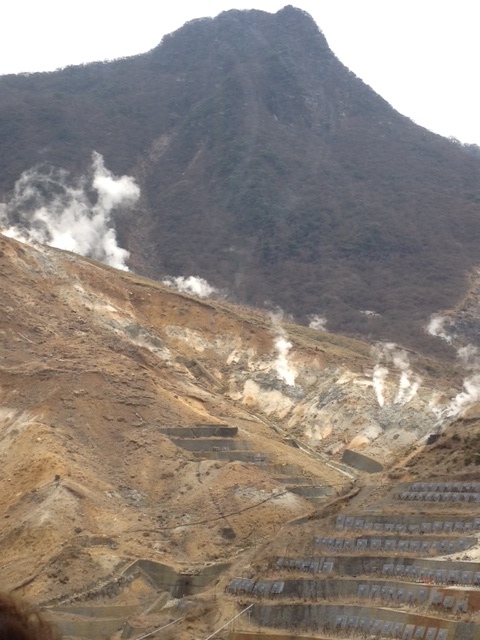 From the Fujiya, return to Miyanoshita station and take the train down to Hakone-Yumoto. From there transfer onto the local train and return to Odawara. 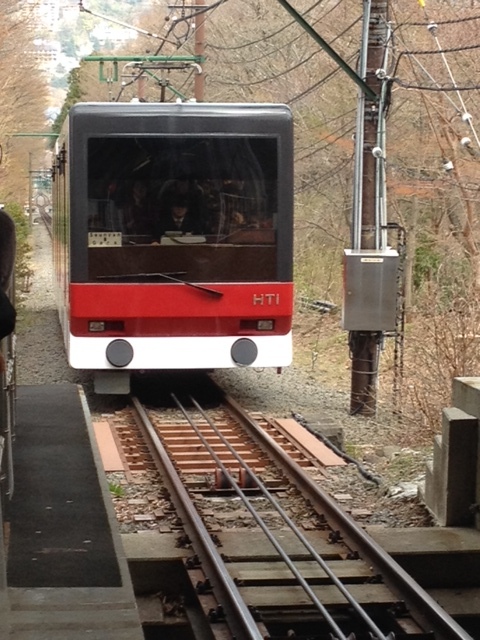 From Odawara it’s easy to take a train back to Tokyo, and you have visited Hakone backwards! The same lovely views, same variety of transport, but without all the waiting in line! Now, wasn’t that worth it? 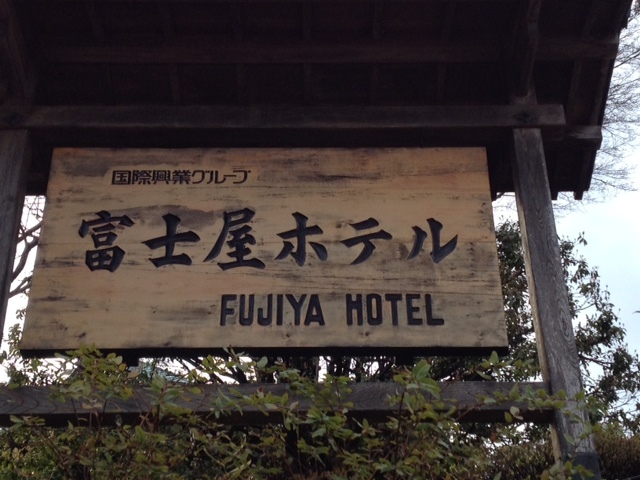 This entry was posted in Japan and tagged Fujiya Hotel, Gora, Hakone, Hakone Freepass, Hakonemachi, Lake Ashi, Miyanoshita, Mount Fuji, Odawara, Owakudani, Shinagawa, Sounzan, Togendai, Tokaido line, Tozan bus on May 1, 2014 by tokyopurplegirl.